Alert – India VIX trading at 37 levels and ATM Vols at 38-40 – Buy staggered at 4720-4820 and 4550 worst case. 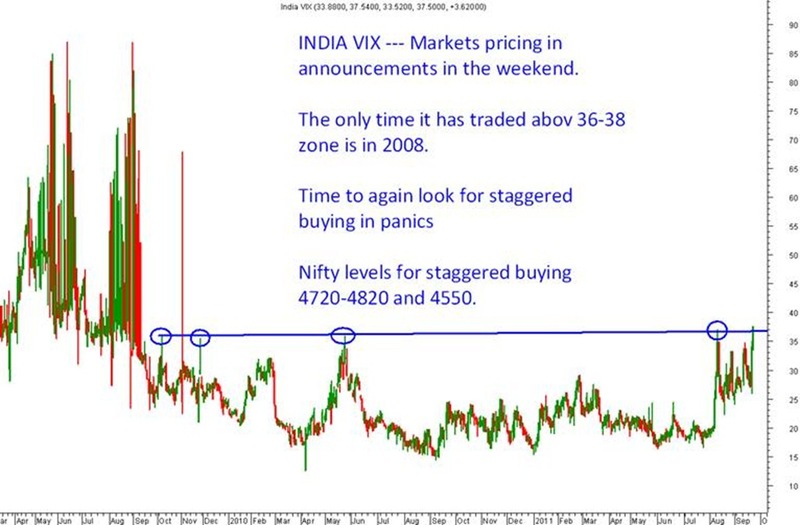 Please find attached a chart on INDIA VIX which clearly suggests extreme panic. - > The last two three times INDIA VIX was above 32 was on 09/08/2011 – Nifty was 4950-500 it bounced to 5195 and next on 26/08/2011 it traded at 32 – Nifty was at 4720-4750 it bounce back to 5150 +. Next on 13/09/2011 Nifty was at 4920 it bounced back to 5150 in next few sessions. - >So panic is at high watch if there is a sharp correction one can look for stock specific buying in a staggered manner . Nifty support points 4820-4720 ideal and in extreme panics at 4550-4480. Resistance 5050/5150. Generally we have seen very sharp bounces to the tune of 6-10 % from such panics. - > Only time Index has traded above 38-40 vols has been in 2008 Lehmann collapse period. Lottery Tickets in Option – Read for Expiry Lottery Call. i want to know where the indiavix can be watched live. please let me know the site of either NSE or BSE or anyof the sites where i can watch this indiavix daily \. You can check on nseindia.com indices statistics. A research that I found at http://www.niftyvix.com says that we should buy Nifty whenever India VIX is high. Do you think it is accurate?